Growing global food demand, climate change, and climate policies favoring bioenergy production are expected to increase pressures on water resources around the world. Many analysts predict that water shortages will constrain the ability of farmers to expand irrigated cropland, which would be critical to ramping up production of both food and bioenergy crops. If true, bioenergy production and food consumption would decline amid rising food prices and pressures to convert forests to rain-fed farmland. Now a team of researchers at the MIT Joint Program on the Science and Policy of Global Change has put this prediction to the test. 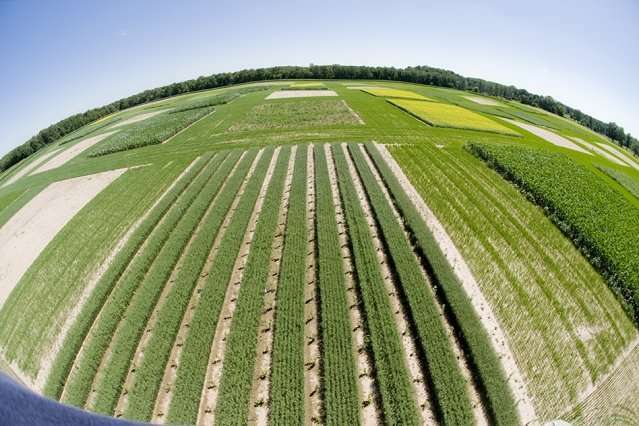 To assess the likely impacts of future limited water resources on bioenergy production, food consumption and prices, land-use change and the global economy, the MIT researchers have conducted a study that explicitly represents irrigated land and water scarcity. Appearing in the Australian Journal of Agriculture and Resource Economics, the study is the first to include an estimation of how irrigation management and systems may respond to changes in water availability in a global economy-wide model that represents agriculture, energy and land-use change. Combining the MIT Integrated Global System Modeling (IGSM) framework with a water resource system (WRS) component that enables analyses at the scale of river basins, the model represents additional irrigable land in 282 river basins across the globe. Using the IGSM-WRS model, the researchers assessed the costs of expanding production in these areas through upgrades such as improving irrigation efficiency, lining canals to limit water loss, and expanding water storage capacity. They found that explicitly representing irrigated land (i.e., distinguishing it from rain-fed land, which produces lower yields) had little impact on their projections of global food consumption and prices, bioenergy production, and the rate of deforestation under water scarcity. The impacts are minimal because in response to shortages, water can be used more efficiently through the aforementioned upgrades, and regions with relatively less water scarcity can expand agricultural production for export to more arid regions. Moreover, the researchers determined that changes in water availability for agriculture of plus or minus 20 percent had little impact on global food prices, bioenergy production, land-use change and the global economy. "Many previous economy-wide studies do not include a representations of water constraints, and those that do fail to consider changes in irrigation systems (e.g. construction of more dams or improvements in irrigation efficiency) in response to water shortages," says MIT Joint Program Principal Research Scientist Niven Winchester, the study's lead author. "When these responses are included, we find that water shortages have smaller impacts than estimated in other studies." Despite the small global impacts, the researchers observed that explicitly representing irrigated land under water scarcity as well as changes in water availability for agriculture can have significant impact at the regional level. In places where rainfall is relatively low and/or population growth is projected to outpace irrigation capacity and efficiency improvements, water shortages are more likely to limit irrigated cropland expansion, leading to lower crop production in those areas. The study's findings highlight the importance of improvements in irrigation efficiency and international trade in agricultural commodities. The research may also be used to identify regions with a high potential to be severely influenced by future water shortages. If Hot springs or Volcanoes are near oceans, DIG A CANAL TO CONNECT. The Sea Water will Evaporate resulting in rains, which means return of Fresh Water to the Land. Also, Attempt to Stop the Rivers Flowing Back to the Oceans i.e Figure out ways to do it properly ! This is a rather limited study in that it doesn't seem to understand or link water availability to energy economics. Like a lot of other resources the cost and availability of energy determines the availability of water resources in most parts of the world. Water isn't a critical resource, its just in the wrong places and takes energy to provide it where it naturally isn't in adequate amounts. Additionally the study doesn't address food production economic relationships to the depletion of finite critical rock phosphate resources (25 years or less in US reserves that according to USDA is now importing more than 50% of fertilizer components from foreign suppliers) which are also petroleum economics (energy and petrochemicals)dependent. Phosphorus - the "P" of NPK fertilizers are still not economically recyclable at agricultural scales. It was phosphorus recycle timetables that largely determined the per-industrial revolutions population to under a billion humans.